Apple’s New iPad 3 is making quite a splash. Several key features really play out to the benefit of media producers for whom ultra-fast turnaround is paramount. With the latest processing horsepower and the latest version of iOS iMovie I think a lot of computers are going to be left collecting dust with this. The new lens touts many advancements for stellar images. The New iPad (they’re not calling it iPad 3, for no fathomable reason) is all around better. Better lens. Lots more megapixels. Image stabilized HD video. Faster A5X chip. So it’ll be able to handle shooting video with ease, “zooming” with your feet (by walking closer) of course. Massive resolution in a small 10" screen. 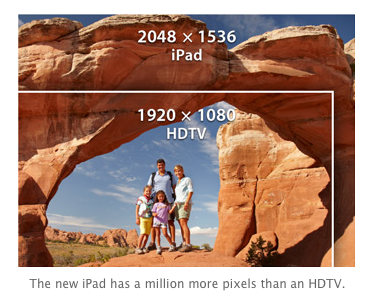 Then you can look at your video with the massively increased resolution of the new “Retina” display. Now it’s well over full HD resolution. So get some bifocals or reading glasses and get closer to the action because there’s tons of resolution in this little 10″ screen. iMovie Editing with themes for quick, polished looking and sounding videos. Then we get to the new iMovie for The New iPad and you can use themes to “wrap” your video and provide “a cinematic soundtrack” to go from raw clips to a polished presentation much faster and easier than ever before. The increased processing horsepower of the iPad will again come into play here for any effects you add to your video- and there are lots of effects in the new imovie so you can make it look quite different than what you started with. The new iMovie is also available for iPod Touch and iPhone, so those users can get in on the act here as well. Te AppleTV enables wireless playback of your videos for everyone to see. Lastly, the AppleTV, which is still just a stand-alone product, now operates more like a wireless playback accessory for the iPad. You can connect this to any projector or TV at the event and wirelessly send your finished video from the iPad (or other iOS device) to the AppleTV and deliver it to your customers without ever having to move it from the camera. As an added bonus, the new 4G LTE lets you also push it to online video services with record speed, so everyone attending can watch it again, or share your video with others. And in this age of social media, being shared is very good business indeed. Do this a couple times and the hardware has literally paid for itself. Computers collecting dust? Not in the professional world. Apple has essentially lost the professional market witht he release of FCP X. But then, the professional market has not been a concern for Apple for some time. But this looks fantastic for the casual user! Cell phones with quality cameras are already dramatically reducing sales of point-n-shoot cameras. People are using tablets as opposed to laptops or desktops for casual computing, and tablets will only get more powerful as time goes on.